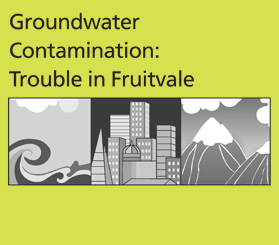 Groundwater Contamination: Trouble in Fruitvale is a SEPUP module designed for use in grades 6–12. The module contains a series of 12 activities that provide approximately 3–4 weeks of instruction. This module focuses on earth science concepts such as the water cycle, groundwater pollution, map making, and map interpretation. These concepts are used in an investigation of groundwater contamination in the fictional city of Fruitvale. Students design and carry out a plan for testing water from different parts of the city to determine the contamination’s source, severity, extent, and rate of travel. These data are used to analyze the risk to Fruitvale’s water supply. Students then read about several clean-up options and participate in a role play of a town meeting to decide which clean-up option to use. Students are assessed on their ability to analyze data.